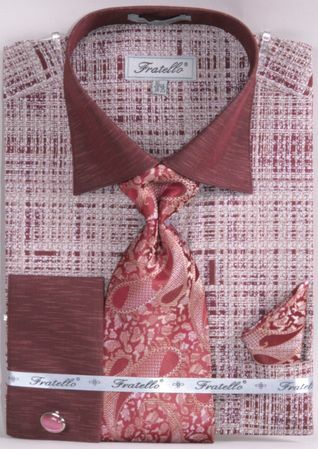 Etch a positive reputation for style by simply wearing these great looking fancy dress shirt and tie sets by Fratello. Fratello makes unique looking dress shirt and tie sets designed to make you stand apart from the boring dressers that look like they just left an IBM convention. This rich looking burgundy plaid dress shirt features french cuffs and a spread collar that matches. The tie and hanky set comes with it. Ready for style. Made of cotton/poly fabric.